The Whatcom Center for Philanthropy (WCP) is a collaboration between the Chuckanut Health Foundation, United Way of Whatcom County and the Whatcom Community Foundation. These three philanthropies are pursuing new and different ways of working together as well as with our nonprofit partners in order to better serve and support all of our Whatcom County neighbors. Each organization has its own suite of offices as well as shared conference rooms that are available for use by our nonprofit partners free of charge. Our goal is to create an environment where connections are made, ideas are shared and great things can happen. We are happy to announce that local nonprofit organizations that have a professional association with Chuckanut Health Foundation, United Way of Whatcom County and/or Whatcom Community Foundation may now request to reserve these meeting rooms. The Large Conference Room has seating capacity of 24 for theater or classroom style events. The room has ten 6-foot tables equipped with power and Wi-Fi access, a ceiling mounted projector and screen and a wall mounted monitor with Wi-Fi capability. The room also has a small kitchenette with sink and refrigerator. 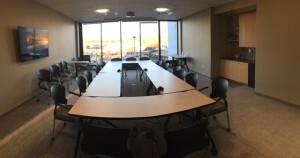 The Small Conference Room has seating capacity for ten with four 5-foot tables with power receptacles. The room is equipped with a wall mounted monitor and Wi-Fi access. Weekday use: The conference rooms are available on a limited basis for meetings Monday through Friday between the hours of 8:30 a.m. and 4:30 p.m. depending upon availability. Reservation must allow for adequate time for set up and clean up within the WCP’s regular office hours. Please do not request to have time extended. Weeknight and weekend use: The WCP Large conference room is also available for preapproved evening and weekend events, with use between the hours of 8am and 10pm. Reservations will be accepted on a first come first served basis. Organizations may reserve space for up to 60 days and no less than two weeks in advance. Exceptions may be made with prior approval from the WCP directors. WCP organization events take priority over outside organizations. WCP reserves the right to reassign your event to a different conference room if necessary. Eligible organizations may use the facilities up to four times per year (January 1 – December 31). To reserve a room, please fill out our online request form AND review the below Conference Room Policy, Checklist, and Audio Visual instructions. Please allow one week for your request to be approved. Attend the next Igniting Philanthropy Series session on October 18th at the Bellingham Golf & Country Club to learn more about how to grow an organization-wide culture of philanthropy! 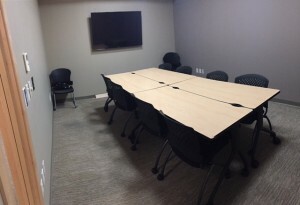 Reserve a meeting room at the Whatcom Center for Philanthropy! Click HERE for more information.